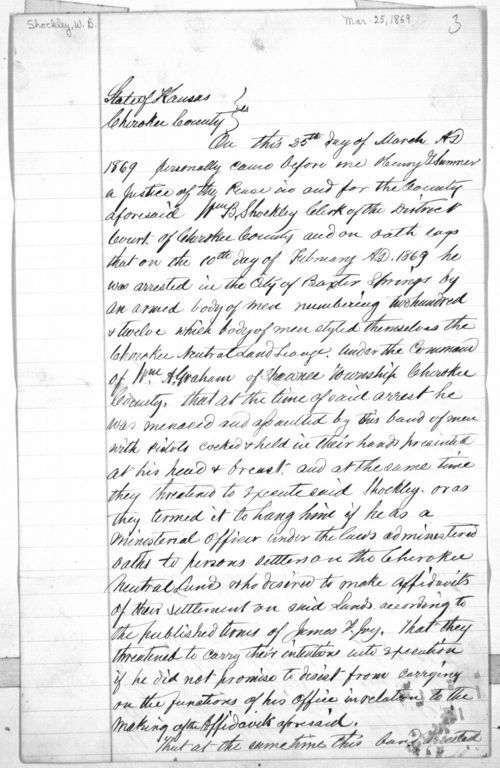 William B. Shockley, Clerk of the District Court at Cherokee County, testifies before Henry G. Sumner, Justice of the Peace of Cherokee County, concerning an armed band of men opposing the operation of a land office at Baxter Springs (Cherokee County). The band of two hundred and twelve armed men identified themselves as the Cherokee Neutral Land League. The League arrested or threatened persons associated with the land office and raided the office to steal its plat maps and land entries. The League was composed of many settlers of the Cherokee Neutral Lands, which lands were open for sale in 1866 by treaty with the Cherokee. The League's actions were an attempt to stop the construction of a railroad by the Missouri River, Fort Scott & Gulf Railroad whose recent purchase of the lands many considered illegal. James F. Joy represented the railroad. In May 1869, Governor James Harvey appealed for federal troops to help control settler violence.